Amara had a wonderful birthday party. We had perfect weather again this year. 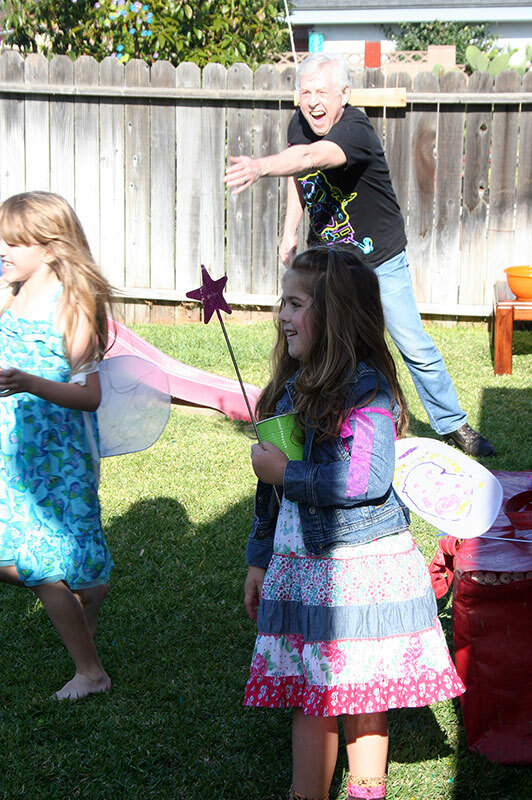 It was a very mild but sunny 70 degrees; just the right temperature for a bunch of fairies to fly, bounce and be creative. And they did all that and more. The kids worked so hard to make this a great party for Amara and her friends. 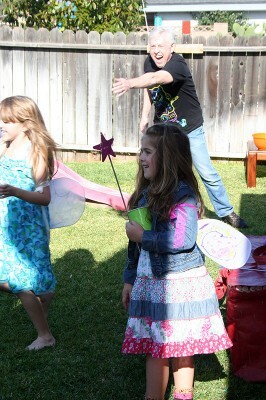 This year’s theme was fairies. 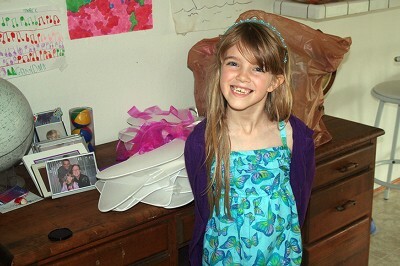 Mommy found a video online that showed how to make fairy wings out of coat hangers and white tights and they had made a pair of wings for each girl; you can see them on the desk behind Amara in the picture above. Each set of wings was bent differently and from what I hear bending them was not easy. Each fairy got to pick out her own wings and take them to the decorating table where Amara’s other Grandma helped each girl to decorate them. 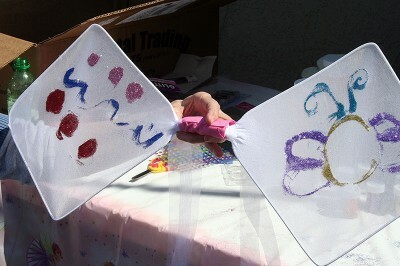 We had every glitter imaginable with glue and gems. Each set of wings was unique and beautiful. 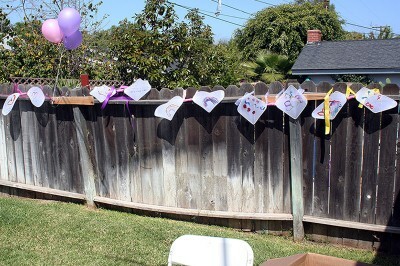 They hung them on the fence to dry while they played. They also got to pick out their own magic wand to use. 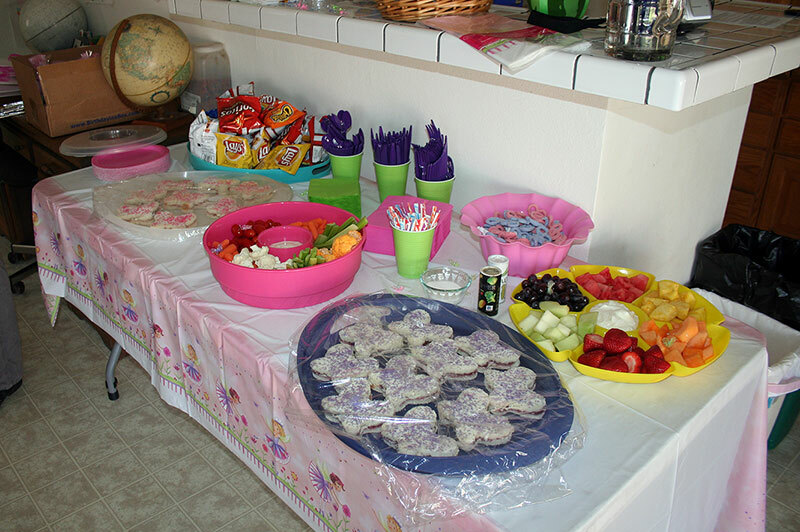 Mommy and I had prepared a feast fit for fairies and the table decorations and everything were so cute. 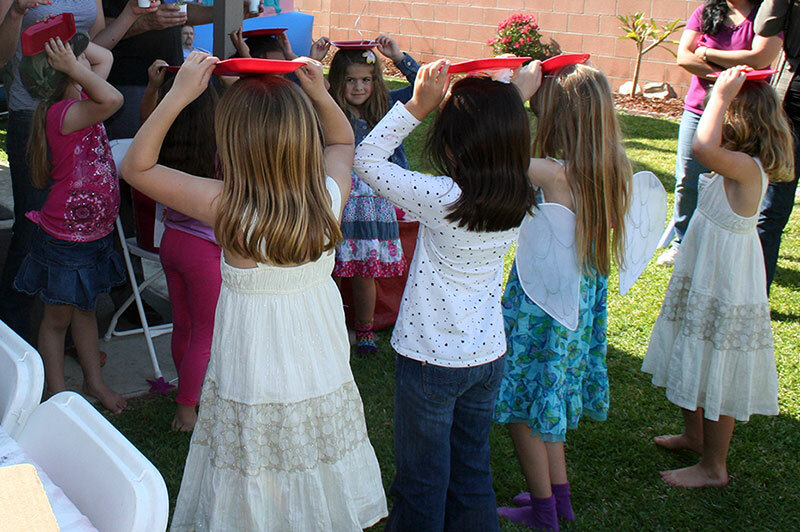 We served fairy sandwiches which are made from grape or strawberry jelly and cut with a cookie cutter in the shape of butterflies. Mommy coated them with thinned cream cheese and sprinkled them with colored sugar — pink for strawberry jelly and purple for grape. They were so cute. The fairies also had lots of fresh fruit and fresh veggies to bunch. And of course Pixie Sticks! For the grown ups there were meatballs. Of course there was a bouncy house. I am betting that all of those girls slept good that night! There was a rule that no wings or wands were allowed in the bouncy house but I think that rule got broken towards the very end of the party. Amara was sure that if they had wings on and bounced high enough they might be able to fly! Amara’s Daddy had planned some great and very creative games. Last year he invented this present passing game that the girls love. The girls sit in a circle around him. He has a gift/prize that he has wrapped in advance in a bunch of different layers. The first girl unwraps the first layer. Each layer has instructions as to what to do with the present next, maybe pass it to the person across from you, pass it left 3 players, pass it as fast as you can to the right until the timer goes off, etc. The kids love this game! And Amara’s Daddy looks very happy referring it. The next event was the Fairy Jewel Relay Race. Even more fun! Each team had 2 members and the object of the game was to hold a slippery paper plate full of Fairy Jewels (Orbeez) on your head, pass them to your team mate who then dumped them in their bowl at the end of the race — then do it over and over again until the timer goes off. The team with the most Jewels in their bowl wins. 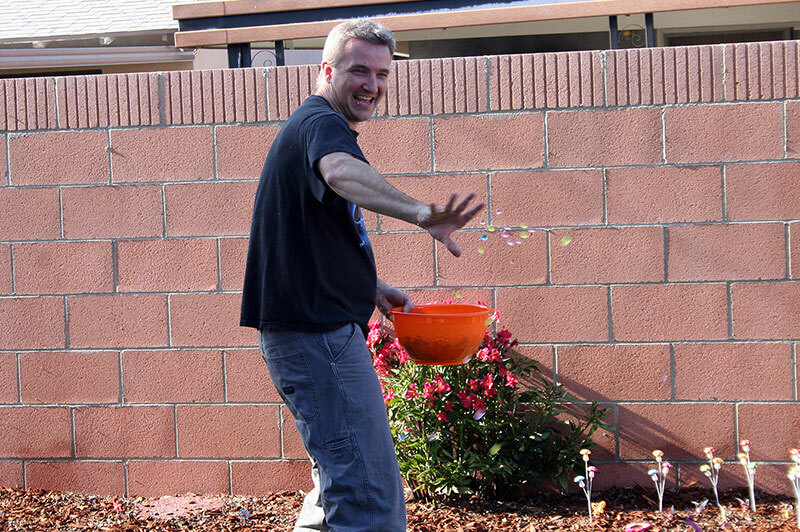 If you’re not familiar with Orbeez, you’re not alone. They’re so much fun! When you get them they are dry and a little smaller than a pea — and they come in all colors. You have to “grow” them in water in advance. Until you have touched them they are very hard to describe. These were about the size of a marbles and when you stick your hands deep into a bowl of them they feel very wet and smooth but your hands come out almost dry. You can break them and they are fun to stomp on. Daddy also had created a Bounce the Jewel game which was played throughout the party. 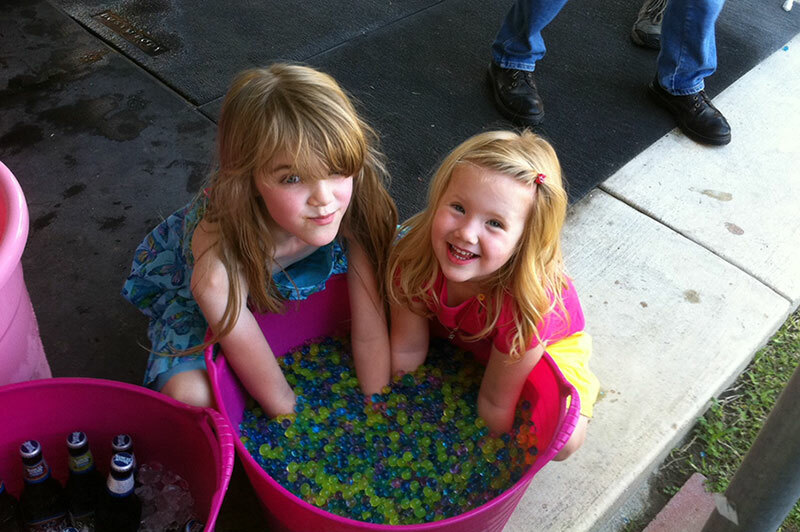 Each girl was given 20 Jewels to try and bounce across the table and into the bowl — another fun Orbeez game. Next was cake because everyone knows the cake is the most important part. Mommy always gets the cake from ABC Bakery and again this year it was not only beautiful it was delicious, especially with ice cream on top of it! That’s another advantage of having the party here, they leave us some cake for later and they forgot to take the ice cream home. I think one of the best and most unplanned parts of the event was the Orbeez Wars! All of the girls against Daddy and Grampy. 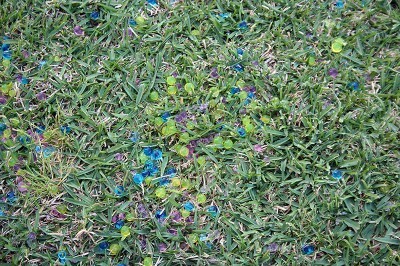 AmaraLand is covered in a layer of Orbeez. 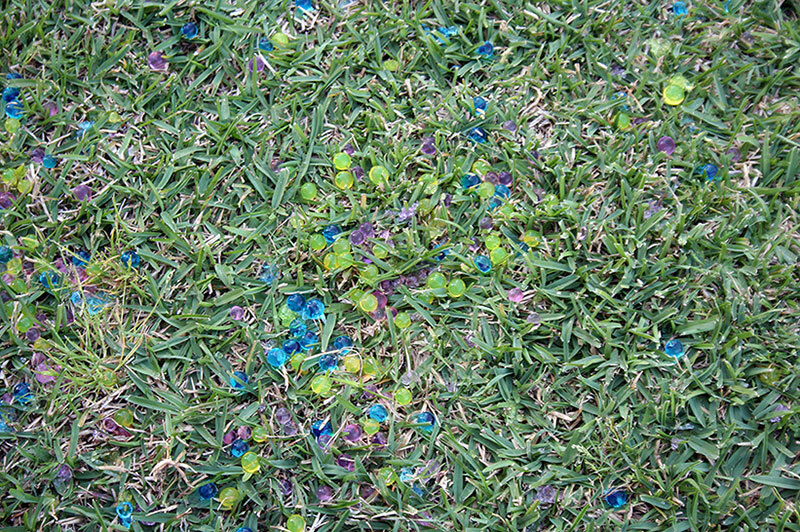 They are supposed to be biodegradable, I hope so because I love the way they look in the grass, makes me smile and think of the party every time I look out there. It was the perfect party on a perfect day, unless you were Twiggy or Twursula. They went into hiding at 8:30 AM when the bouncy house arrived and we finally got them out around 7 PM. They were not amused. 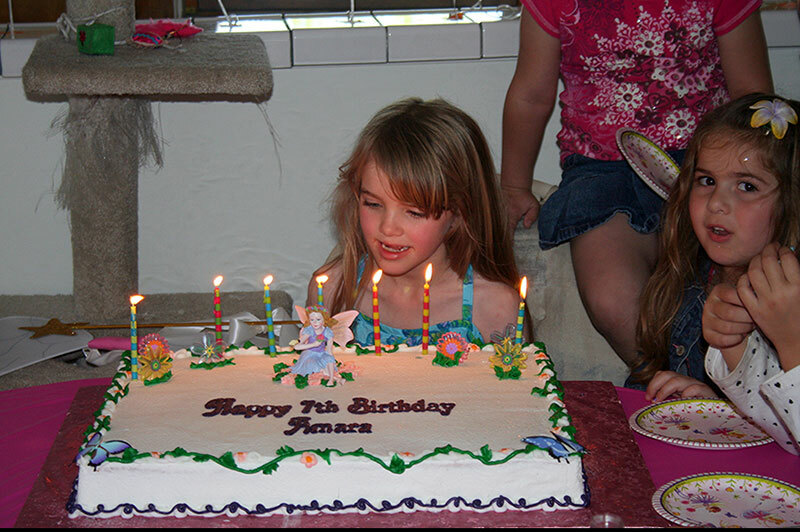 This memory was posted in Grandparents, Special Occasions and tagged Amara, birthday, bouncy house, cake, fairies, fairy, games, ice cream, Orbeez, wings on April 25, 2011 by Grandma Kc. Sounds like an enchanted day with lots of fun for little fairies. I’ve never heard of Orbeez, but I’ll be checking them out now. Like Lisa, I’ve not heard of Orbeez, but I’m always on the hunt for something new and fun for the grands! It sounds like a very special birthday that all the little fairies will remember always! I’ve got to check out these Orbeez things too! The little fairy wings were adorable. I love the picture with them all drying on the fence! How precious! I’m glad the party was a huge success!! As usual, all the adults put a lot of love and thought into it. Great job!!! Amara is a beautiful girl. Great party and game ideas! So cute. What a fun, fun party! 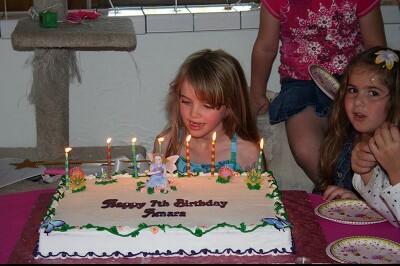 Wish I was 7 again (and a friend of Amara). What a fun party! 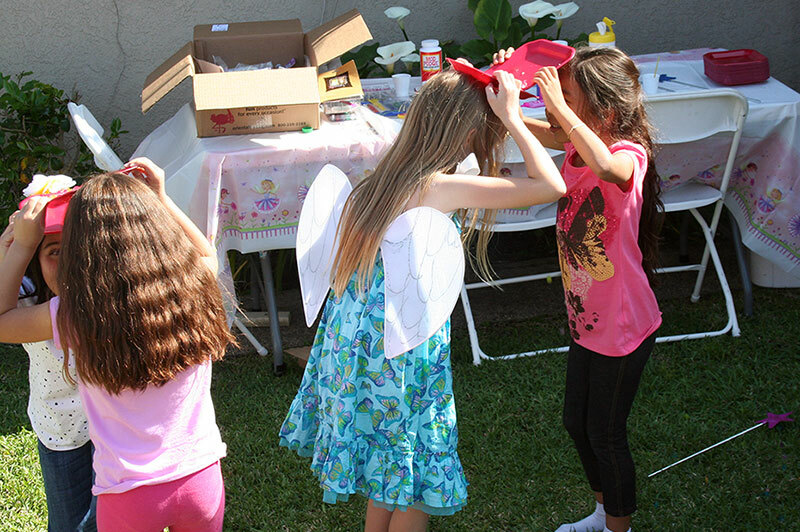 I love the fairy wings and will be checking out the Orbeez. Thanks for coming by Grams Made It. I love, love, love your “moments” page. What a great idea! Wonderful post Grandma KC. What a happy time for all, the games sound amazing. In New Zealand fairy bread is made with 100s and 1000s. I make a whole loaf & freeze for Bella & Lucy to take in their school lunch box. Yes, even a 15 year old loves fairy bread! When lunch time comes around the sandwiches have thawed. This Grandma just learned something! I had no ideas what 100s and 1000s were so had to Google! For those of us in the United States they are jimmies. I can see why the girls would love those sandwiches! Amara and I have even put jimmies in our pancakes! The girls are going to learn so much being pen pals! This was one of the first posts I read at Amaraland. I still love your ideas. And it’s been fun getting to know you over the past couple of years. Such an adorable party with adorable girls. Far different (yet very similar) to a Super Hero party my daughter recently had for my oldest grandson. Instead of fairy wings, they made super hero capes. Precious Amara, as always. Thank you for sharing her once again in this week’s GRAND Social!